For Honor is built around the idea that each of us has fantasised about the kind of historical warrior we might have been. We saw that in last month's video about the game's origins, in which creative director Jason VandenBerghe spoke about how our inner warriors represent our values. This video showcases one of the warriors from the Samurai class, known in-game as the "Chosen". I Googled "Oni" and apparently they're a kind of supernatural demon type from Japanese folklore, but in this case they appear to just be a subset of the Samurai class. If you value skill, mastery, and honour, this could be you. As seen in the trailer, an Oni is a "skilled duelist", "quick and lethal", and "inspires fear", the latter of which I'm not sure will be represented in-game, but I'm willing to be surprised. They wear light armour made from wood and leather, and bear a "classic Japanese Katana", not like those modern ones with all their bells and whistles. The video also lists three key abilities for the Oni: Kunai (a dagger), a poisoned blade, and "Arrow Storm". I initially thought there would only be one kind of Hero from each faction, so I'm looking forward to finding out more about the variety of abilities and weapons available. 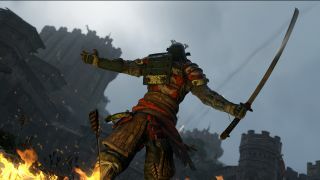 For more about For Honor, check out this hands-on from Wes.